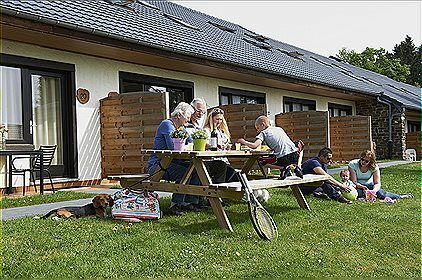 Domaine la Sapiniere is a cozy holiday park in Luxembourg. Surrounded by the foothills of the Ardennes it is the ideal place for a walking holiday or to explore the area by bike. It is a real family park with all kinds of facilities, the kids will certainly enjoy the summer outdoor pool, the playground and the miniature golf. Next to the park is a beautiful indoor swimming pool where our guests can swim for free for 2 hours every day. Parents, the sauna and steam baths of Aqua Nat'Our will delight you. The restaurant offers tasty dishes, from simple snacks to a complete menu. A large number of homes in the summer of 2015 completely renovated and fully equipped. The bungalows at the park are available in different shapes and sizes. From homes for 3 or 4 people to large and luxurious 16 person bungalows. Many have a bathtub, some also have a hot tub, sauna or fireplace. 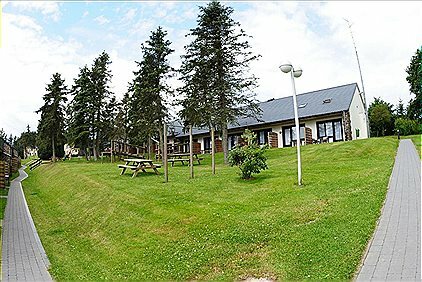 So whether you choose a family weekend in autumn or spring or for a wonderful stay in the summer, la sapiniere holiday park awaits you. Although Luxembourg offers a lot of nature, there is also enough culture to sniff. Not far from the park are the cozy and authentic towns of Clervaux and Vianden, castles and the city of Luxembourg is also a good city break. Other tips for day trips include the butterfly garden, the fairy tale forest Parc Merveilleux, the reservoirs of Weiswampach, Eifelpark and various climbing parks. A day of hiking in the Müllerthal with the famous waterfall Schiessentümpel should not be missing from your holiday in Luxembourg . Be sure to bring the dog too, he will love it. La Sapinière is ready for you all year round.